On June 4th, the area’s hottest chefs will dish up special tastings to raise funds for Food & Friends. 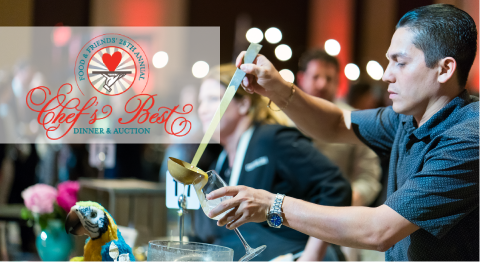 Washington, D.C. – On Monday, June 4th, 40 of the area’s best chefs and mixologists will serve up special tastings of their signature dishes at Chef’s Best Dinner & Auction. Hosted at the Marriott Marquis, Chef’s Best will benefit Food & Friends, a non-profit organization based in Washington, DC that provides life-sustaining meals to those living with HIV/AIDS, cancer, and other serious illnesses. Thanks to the efforts of Chef Chair Ari Gejdenson of Mindful Restaurants Group (Acqua al 2, Ghibellina, Ari’s Diner, and more), guests will enjoy tastings prepared by some of the region’s most talented chefs including: Kevin Tien, Himistu, Harper McClure, Brothers and Sisters, Carlos Delgado, China Chilcano, Johanna Hellrigl, Doi Moi, and Malkhaz Maisashvili of Supra, among other notables from the D.C. dining scene. In addition, attendees will have the opportunity to bid on an array of exciting silent and live auction items featuring fantastic trips, one-of-a-kind experiences and private dining opportunities. Proceeds from Chef’s Best will ensure the delivery of nutritionally-tailored meals and personalized nutrition counseling to Food & Friends’ clients living with cancer, HIV/AIDS and other life-challenging illnesses. This year, Food & Friends will provide nearly 1 million meals to more than 2,800 seriously ill individuals in Washington, DC, Virginia and Maryland. The event will also honor longtime Food & Friends’ Executive Director, Craig Shniderman, now in his final year at the organization, as this year’s Chef’s Best honoree. Over the course of his 23-year tenure, Shniderman has played a key role in transforming Food & Friends from a small operation in a church basement into a bustling, innovative, life-sustaining service caring for neighbors with a wide range of diseases. “Over 23 years, the Food & Friends community has become my second family. I feel privileged to have worked alongside so many dedicated community members in service to our neighbors facing life’s greatest challenges,” said Shniderman. Tickets are $350 and sponsorships start at $1,000. Visit www.foodandfriends.org/ChefsBest to purchase tickets and see a current list of chefs and sponsors. The President’s Reception for sponsors begins at 5:30pm. Doors open for the main event at 6:30pm, with live auction bidding starting around 8:30pm. Food & Friends depends on the support of corporations, foundations and individuals and is grateful for the sponsors who have contributed to Chef’s Best. Food & Friends is a Washington, DC, based nonprofit organization that provides home-delivered, nutritionally-tailored meals and nutrition counseling to people living with HIV/AIDS, cancer and other life-challenging illnesses. Food & Friends’ services are free-of-charge to recipients, who qualify solely based on their health status and nutritional need. Monday-Saturday, staff and volunteers deliver to more than 5,300 square miles including the District of Columbia, seven counties in Maryland, and seven counties and six independent cities in Virginia. Since 1988, Food & Friends has delivered more than 21 million meals to nearly 31,000 individuals. For more information, please visit www.foodandfriends.org, Facebook (/foodandfriends), Twitter (@foodandfriends) or Instagram (@foodandfriendsdc).